As Super Bowl XLVIII between the Denver Broncos and the Seattle Seahawks is this Sunday I thought I would do a list Top 10 Denver Bronco players of all time. 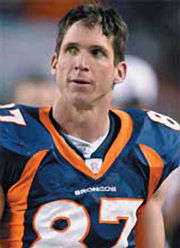 Ed McCaffrey is a former wide receiver for the New York Giants (1991 – 1993), San Francisco 49ers (1994) and Denver Broncos (1995 – 2003). During his 13 year career he won three Super Bowl rings and made a Pro Bowl appearance in 1998. McCaffrey set a Broncos record for most receptions in a season. In 2000 McCaffrey and teammate Rod Smith became only the second wide receiver duo from the same team to each gain 100 receptions in the same season. McCaffrey has his own brand of mustard and horseradish sauce. In 2012, McCaffrey was named the new color analyst for 850 KOA, flagship station of the Denver Broncos Radio Network. Floyd Little is a former running back. 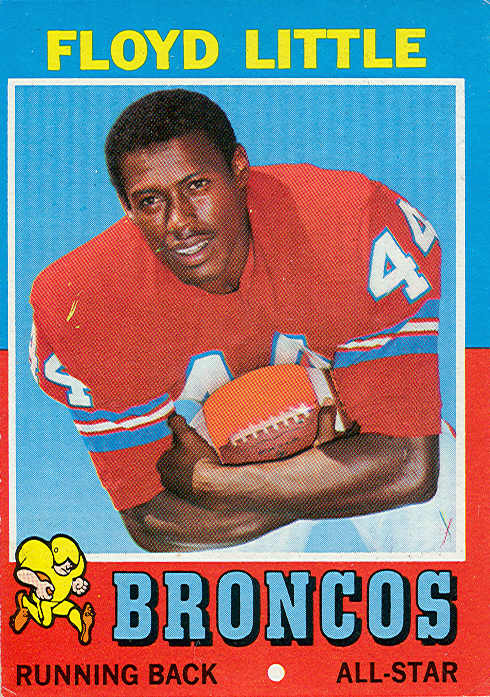 Little played for the Denver Broncos from 1967 – 1975. Little was inducted into the Pro Football Hall of Fame in 2010. At the time of his retirement, in 1975, he was the 7th leading rusher in professional football history with 6,323 yards rushing and 43 touchdowns. Little was the first Bronco to win an AFC rushing title. Peyton Manning is a quarterback for the Denver Broncos. Manning is a four-time MVP. He played for the Indianapolis Colts for 14 seasons from 1998 – 2011. He dubuted for the Denver Broncos in 2012. 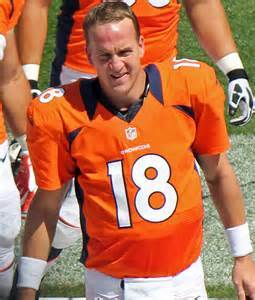 Manning is the son of NFL quarterback Archie Manning and elder brother of New York Giants quarterback Eli Manning. In 2009 he was named the best player in the NFL, he was also named NFL player of the decade for the 200’s. Manning will be making his third Super Bowl appearance at Super Bowl XLVIII. 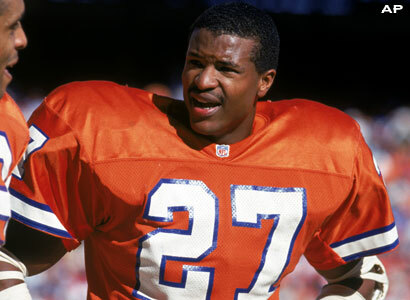 Steve Atwater spent most of his time as a free safety for the Denver Broncos. He was nicknamed the “Smiling Assassin.” He played college football for the University of Arkansas. Atwater debuted for the Denver Broncos in 1989 and played until 1998. After he left the Broncos he signed with the New York Jets as a free agent for his final season in 1999. He was an eight-time Pro Bowl selection and two-time Super Bowl champion. 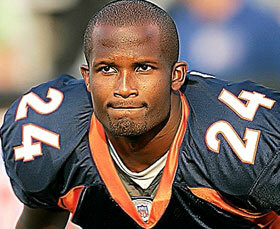 Champ Bailey is a cornerback for the Denver Broncos. He played college football for the University of Georgia and earned All-American honors. Bailey has played for the Washington Redskins and the Denver Broncos. He debuted for the Washington Redskins in 1999 and played until 2003. He debuted for the Denver Broncos in 2004 and is still playing. During the 2013 off season Bailey was named the 53rd best player in the NFL. He will be playing in his first Super Bowl this Sunday in Super Bowl XLVIII. 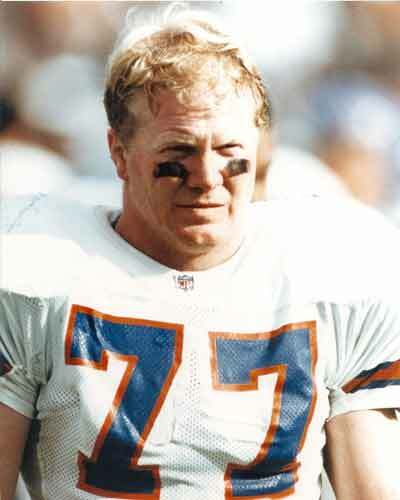 Karl Mecklenburg is a former linebacker for the Denver Broncos. He debuted for the Broncos in 1983 and last played in 1994. His 79.5 ‘sacks’ is the second highest total in franchise history. He is in the Colorado Sports Hall of Fame and serves on the Broncos Alumni Council. 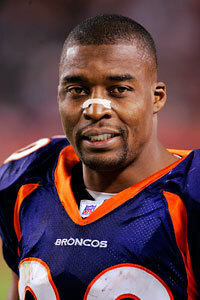 Rod Smith is a former wide receiver who played thirteen seasons for the Denver Broncos. He played college football at Missouri Southern State. Smith debuted for the Broncos in 1995 and last played in 2006. He was originally signed by the Broncos as an undrafted free agent. He is the only undrafted player to reach 10,000 receiving yards. 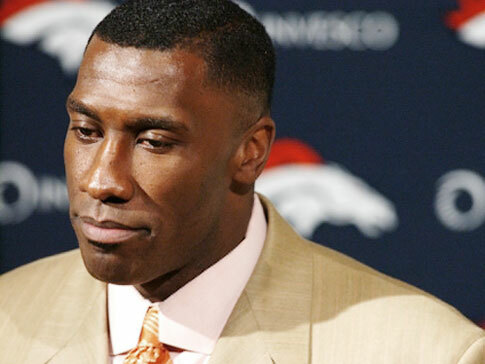 Shannon Sharpe is a former right end who played for the Denver Broncos and the Baltimore Ravens. Sharpe debuted for the Denver Broncos in 1990 and remained until 1999. He then played for the Baltimore Ravens before returning to the Broncos and last played in 2003. Sharpe was inducted into the Pro Football Hall of Fame in 2011. He played on the winning side at three Super Bowl and finished his career as the NFL’s all-time leader in receptions (815), receiving yards (10,060) and receiving touchdowns (62). Sharpe is now a commentator for CBS Sports. 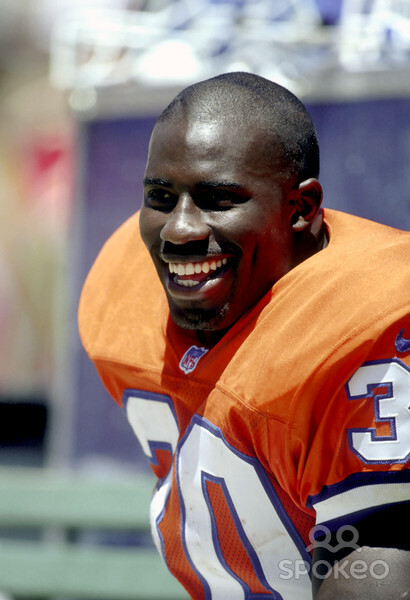 Terrell Davis is a former running back for the Denver Broncos. Davis debuted for the Broncos in 1995 and last played in 2001. Davis is the Denver Broncos all-time leading rusher with 7,607 rushing yards. Davis and John Elway are the only two Broncos named league MVP. Davis was on the cover of the video game “NFL Game Day 99” by 989 Sports. 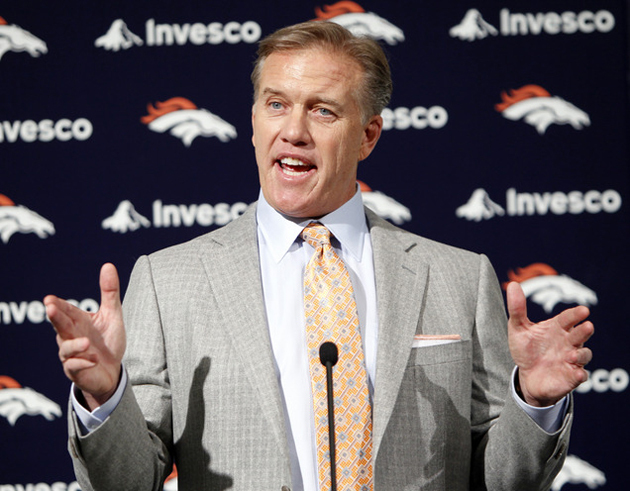 John Elway is a former quarterback for the Denver Broncos. He played college football at Stanford and his entire professional career with the Broncos. He debuted for the Broncos in 1983 and last played in 1999. Elway was inducted into the Pro Football Hall of Fame in 2004. He is now Executive President of Football Operations for the Denver Broncos. He is one of only two players to ever score a rushing touchdown in four different Super Bowls and the only quarterback to do so.